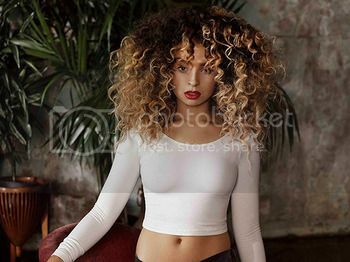 Ella Eyre has some of the best, and largest hair in the music industry. Ever since I saw her perform with Rudimental in 2013 I have had a massive crush on those curls. I love it! The curls are just gorgeous, and the colour works so well at adding definition. Apparently the secret to Ella's amazing hair is a various number of tongs and wands, with just shampoo and conditioner being used. And a good hair repair treatment from all the heat styling! Her natural hair style is slightly more afro, with the usual frizz that most have with tightly curled hair. There's also some extensions in there I think, to add volume and length. I think the shorter, almost fringe like bits look great and add shape to the overall style. I've been using the Lee Stafford Chopstick Styler and have been so impressed with the long lasting, tight curl that's created - it's my own version of Ella Eyre, but with less hair. The full review (and video) is coming later this week, and I know I'll be wearing my hair like this for Glasto! So excited - although slightly gutted Foo Fighters have pulled out due to old God Grohl breaking his leg.